The wide collection of cross-national Pew Research Center surveys analyzed in this report on age gaps in religious commitment can also be used to look at the ways religious observance varies among all adults – defined as people ages 18 and older – in different parts of the world. Nevertheless, by these measures, some global patterns are clear: The most religious countries are in Africa, the Middle East, South Asia and Latin America, while people generally are less religious in Europe, North America, East Asia and Australia. For a discussion of theories that attempt to explain these regional variations, see Chapter 1. Overall, in the average country surveyed, 54% of adults say religion is very important in their lives. However, levels of religious commitment vary widely around the world, as well as between countries within the same geographic area. In the Asia-Pacific region, for instance, the share of those who say religion is very important in their daily lives is highest in Muslim-majority countries such as Pakistan, Indonesia and Afghanistan; in these countries, more than 90% say religion is very important. Meanwhile, Japan (10%) and China (3%), where majorities of the population are religiously unaffiliated, have the lowest shares of people who say this. There is also wide variation in Latin America, with the share of those who say religion is very important ranging from 90% in Honduras to 29% in Uruguay. 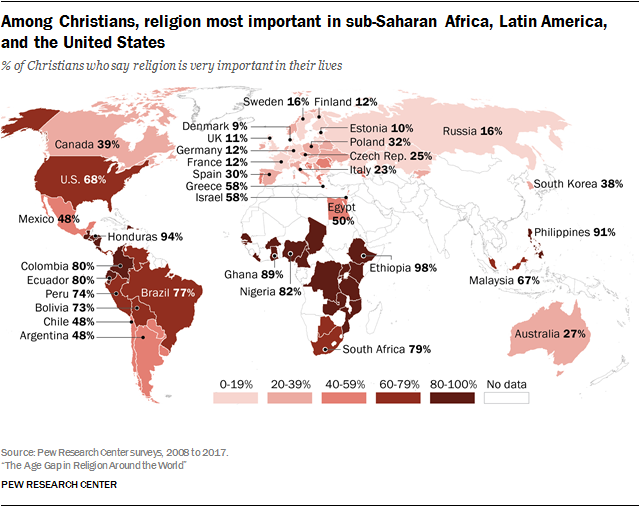 In general, religion is more important to people in Central America and less important moving south toward Argentina and Chile and north to Mexico. Further to the north, U.S. respondents (53%) are about twice as likely as Canadians (27%) to say that religion is very important. The share of adults who consider religion to be very important in their lives is generally low in Europe, where 23% of survey respondents in the average country say this. Bosnia-Herzegovina, Georgia and Romania, where at least half of people say religion is very important, are above the regional average on this measure, while in most countries in the Baltics, Scandinavia and Western Europe, fewer than one-in-five say religion is very important in their lives. In sub-Saharan Africa, on the other hand, the share of respondents who consider religion very important in their daily lives is much larger, ranging from a high of 98% in Ethiopia to a low of 71% in Botswana. In all but two countries in the region (South Africa and Botswana), more than 80% of adults say religion is very important to them, yielding a regional average of 89% who say this. 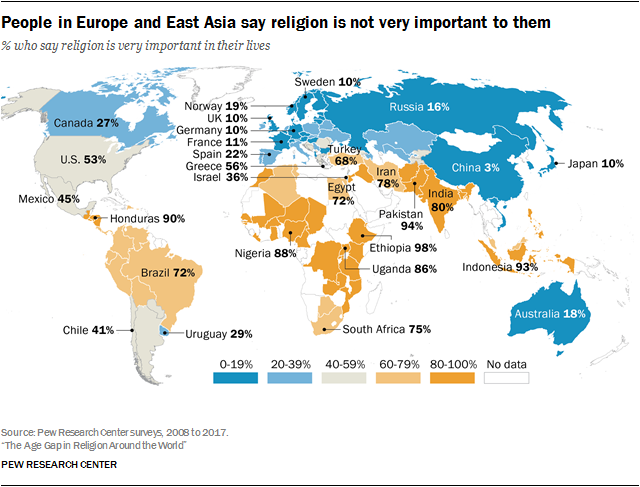 In the Middle East and North Africa, at least 70% of people say religion is very important to them in all countries surveyed except Lebanon (57%) and Israel (36%). Christians and Muslims – the two largest religious groups in the world – have substantial populations in several regions, and Pew Research Center data permit analysis of how religious commitment varies among members of these two groups in different parts of the world. Christians in sub-Saharan Africa are most likely to say religion is very important in their lives, while those in Russia and Western Europe are least likely to say this. Muslims, meanwhile, widely rate religion as very important in their lives in Africa, the Middle East and South and Southeast Asia; religion is less important to Muslims in Europe and the post-Soviet republics of Central Asia. U.S. Muslims fall somewhere in between. About four-in-ten adults in the average country surveyed say they attend religious services at least weekly. But this figure varies widely in different parts of the world, in part due to geographic differences in religious commitment and in part due to religious norms. For example, unlike those who practice Abrahamic faiths, Buddhists and Hindus do not observe weekly holy days, and weekly communal worship services are not necessarily a part of their religious traditions. 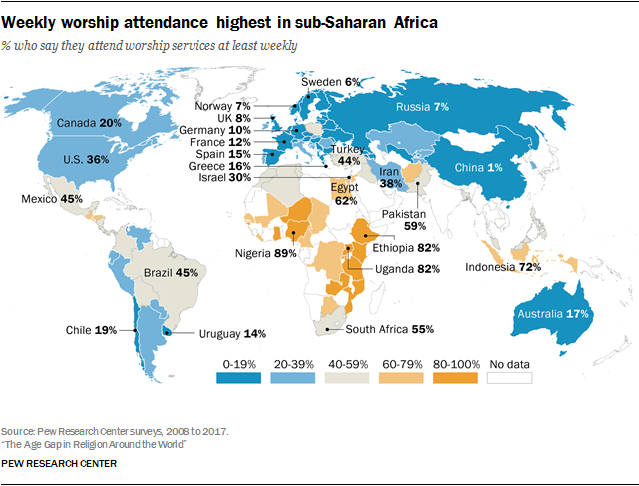 Countries in sub-Saharan Africa with predominantly Christian or Muslim populations tend to have the world’s highest levels of regular worship attendance; in the average country in that region, 79% of adults say they attend services weekly. In 12 sub-Saharan African countries surveyed, eight-in-ten or more adults are weekly attenders; no country surveyed in any other region reaches this level. Attendance across Europe is at the other end of the spectrum. Aside from Poland, where 42% of respondents attend weekly, every other European country in this analysis has rates of attendance at or below 25%. Several countries in Scandinavia and Western Europe are in the single digits. The other major regions fall somewhere in between these two extremes, with wide variation within each region. In the Americas, weekly attendance ranges from 75% in Guatemala to 14% in Uruguay. Slightly more than one-third of U.S. adults report attending weekly, compared with 20% of Canadians. In Asia and the Pacific, weekly attendance is highest in Indonesia (72%) and lowest in Uzbekistan, Azerbaijan and China, all of which have rates of weekly attendance in the single digits. (In China, just 1% of adults report attending religious services weekly.) And in the Middle East-North Africa region, most Jordanians (64%) and Egyptians (62%) attend services weekly, while only 30% of Israelis do. Compared with weekly worship attendance, daily prayer is somewhat more common around the world. In the average country across 105 surveyed, about half of adults (49%) say they pray every day, including majorities in sub-Saharan Africa (75%), the Middle East and North Africa (70%) and Latin America (62%). Prayer frequency varies widely across Asia. Fully 96% of Afghans and 87% of Iranians – both overwhelmingly Muslim populations – report praying daily, reflecting a global pattern of high levels of prayer in Muslim-majority countries (prayer is one of the Five Pillars of Islam). Daily prayer is also very common in Hindu-majority India, where 75% pray daily, but it is much less common in some other parts of Asia, such as Vietnam (14%) and China (1%). Low levels of prayer can also be found across Europe, where, in the average country, fewer than one-in-four respondents pray daily. In North America, meanwhile, Canadian respondents are less than half as likely as their U.S. counterparts to pray daily (25% vs. 55%).